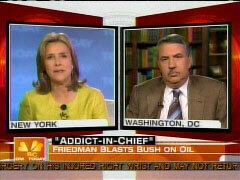 NBC's "Today" show handed "New York Times" columnist Thomas Friedman a platform, on Tuesday's show, to rail against President Bush's "incoherent mess" of an energy policy, and demand a $1/gallon gas tax, as well as a $4.50 price floor on gas. MEREDITH VIEIRA: Well in this column on Sunday, you don't hold back. You refer to the President as our "addict-in-chief." You say his energy plan is, "Get more addicted to oil." You go on to say, "It is hard for me to find the words to express what a massive, fraudulent, pathetic excuse for an energy policy this is." What is it, Tom that, you find so offensive in his energy plan? THOMAS FRIEDMAN: What is his energy plan? Let's remember, Meredith, that on the morning of 9/12, right after 9/11, gasoline in this country was $1.60 a gallon, between $1.60 and $1.80. A lot of people like myself, at the time, said we need to have a gasoline tax, a $1.00 gallon phased in over a year, year-and-a-half that will stimulate the kind of innovation and investment in alternatives so we won't be dependent on people who have drawn a bull's eye on our back. What did the President do? He told us to go shopping. So, we basically have an energy policy that Gal Luft has described, I think very accurately as the "sum of all lobbies." The ethanol lobby is strong, let's do a little ethanol! The coal lobby is strong, don't want to have a carbon tax. So it's actually a complete, incoherent mess. That has resulted where we are. MEREDITH VIEIRA: So is America addicted to foreign oil? "New York Times" columnist Thomas Friedman says the answer is definitely yes. And in his column on Sunday, he put much of the blame on President Bush. He is also writing about energy policy in his upcoming book Hot, Flat, and Crowded due out in September. Thomas Friedman, good morning to you. VIEIRA: Well in this column on Sunday, you don't hold back. You refer to the President as our "addict-in-chief." You say his energy plan is, "Get more addicted to oil." You go on to say, "It is hard for me to find the words to express what a massive, fraudulent, pathetic excuse for an energy policy this is." What is it, Tom that, you find so offensive in his energy plan? FRIEDMAN: What is his energy plan? Let's remember, Meredith, that on the morning of 9/12, right after 9/11, gasoline in this country was $1.60 a gallon, between $1.60 and $1.80. A lot of people like myself, at the time, said we need to have a gasoline tax, a $1.00 gallon phased in over a year, year-and-a-half that will stimulate the kind of innovation and investment in alternatives so we won't be dependent on people who have drawn a bull's eye on our back. What did the President do? He told us to go shopping. So, we basically have an energy policy that Gal Luft has described, I think very accurately as the "sum of all lobbies." The ethanol lobby is strong, let's do a little ethanol! The coal lobby is strong, don't want to have a carbon tax. So it's actually a complete, incoherent mess. That has resulted where we are. VIEIRA: But, you know Tom our addiction, our addiction, our addiction to oil certainly precedes President Bush doesn't it? FRIEDMAN: Of course, our addiction to oil precedes President Bush, but the solution, obviously, requires a long-term, focused, strategic plan, which we have not had in this administration. FRIEDMAN: He's only been here for eight years. VIEIRA: You, you also go after Saudi Arabia in your column saying that increasing production only adds to our addiction. But isn't this, to some extent Tom, about giving consumers a break. What is wrong with increasing the supply when ordinary citizens are struggling to pay for gas at the pump? FRIEDMAN: Sure. You know, Meredith, Saudi Arabia's former oil minister Sheikh Ahmed Zaki Yamani said a long time ago, he said, "The stone age didn't end because we ran out of stones." What did he mean by that? He was lecturing his OPEC colleagues and he was basically telling them, "Boys we want the price to be just high enough, okay, so we can maximize all our return but not so high that the West starts to invent alternatives to oil." So sure the Saudis are gonna give us a break. You know one more injection. Bringing the price down a little. Kill the wind and solar industry. Make sure they don't invent any alternatives. And so you'll get five cents off your gas but, once again, we won't have any long term strategic response to out total addiction to oil. That's just what you want. VIEIRA: Yeah Tom you recommend a price floor on gas of $4.50 because you believe that would force people to start to conserve and look at alternative forms of energy. Do you sense a change in behavior that, that might have some long range results here? FRIEDMAN: Well the change in behavior is obviously happening. If you go to any auto-dealer you'll see that their lots are now piled up with gas-guzzling SUVs. And clearly consumers are looking for alternatives. I was at a Toyota dealer yesterday, they told me it's a three month wait now for a Hybrid Prius. So clearly our consumers are looking for strategic alternatives but the options are few because there's been no long term plan. Remember this administration resisted even improving mileage car standards for almost seven years. Let's not forget that. VIEIRA: And what about the two presidential candidates? Are they saying anything that, to you, suggest that they have a clear understanding of the path we need to take, in terms of our energy policy? FRIEDMAN: I think, I think both are still peddling easy nostrums and easy solutions. No one is talking about what we really need, which is a strategy that combines radical innovation and creating the market incentives for that, conservation and radical energy efficiency. If you don't have that all we're gonna do is postpone the solution. I'm gonna be on this show, a year from now, gasoline will be $5.00 or $6.00 a gallon and you'll be asking, "Will the Saudis give a little break for us?" One more injection into the veins, just to keep us addicted. VIEIRA: Alright Thomas Friedman. Thank you very much.